Motherboard makers introduced the first Mini-STX motherboards at CES last week. 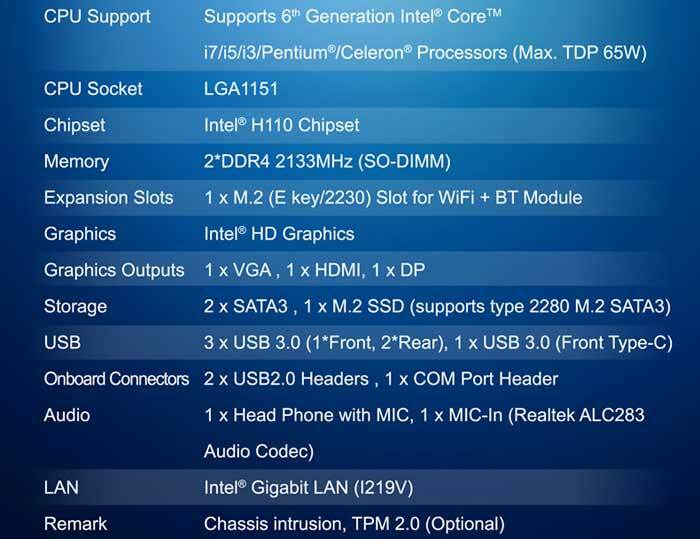 We saw Intel launch the platform, previously known as the 5x5 form factor, in August last year. Now both ASRock and ECS have readied Mini-STX motherboards which support your choice of LGA 1151 CPU; from humble Celeron, to Pentium, Core i3, Core i5, or even a Core i7 processor. As it says in the subheading of this report, these Mini-STX motherboards are the smallest Intel motherboards to support upgradeable CPU choices. This form factor was originally dubbed the 5x5 by Intel as those are the approximate area dimensions of the boards in inches (similar to the size of an Intel NUC). Both the ASRock H110M-STX and ECS H110SU-02 use the Intel H110 chipset. They allow buyers to fit their own choice of sixth generation processor up to 65W TDP. ASRock claims its example is unique in supporting standard desktop CPU fans. 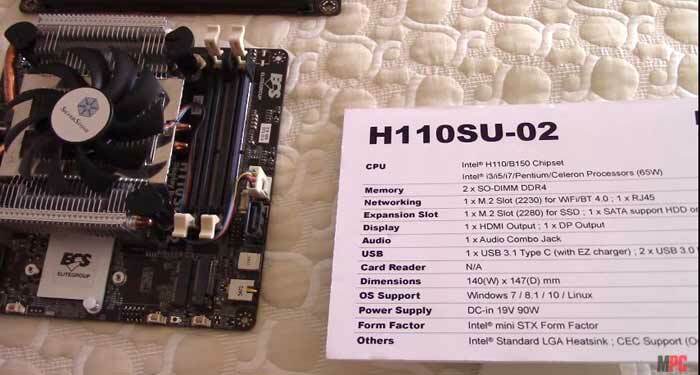 I've embedded the spec list graphic for the ASRock H110M-STX above. As you can see, beyond the processor choice options you can customise your storage thanks to the 2x SATA 3 and an M.2 SSD slot, and you can configure your RAM with the 2x DDR4 2133MHz SODIMM slots available. The motherboard features 3x USB 3.0 ports and a single USB 3.0 Type-C connector. ASRock has developed its product further and built a barebone system around it called the ASRock H110M-STX MINI PC. This PC, pictured above left, measures 1.92 litres (155 x 155 x 80mm). ASRock hasn't given any indications about pricing and availability. Intel had originally touted the 5x5 as being capable of "sub 1 litre system volume," so ASRock has nearly doubled that size. Looking at the ECS H110SU-02, it is basically the same spec as the above described ASRock motherboard. I note that it lacks the VGA connector offered by ASRock and has one less SATA 3 port. However according to Maximum PC it is simply "an engineering sample" at this time. If you are interested in the Mini-STX form factor, there was another product at CES last week that might appeal. Silverstone was showing off a 'proof of concept' chassis, as highlighted by Tom's Hardware. However the chassis didn't even have a name yet, never mind price or availability date. … I take it these won't fit in a uATX case if the situation arises either as the standoff holes will be wrong. OTOH, the board is about the same size as the old nano-itx boards that Via built; but the stand-off hole positions are different from that, too….